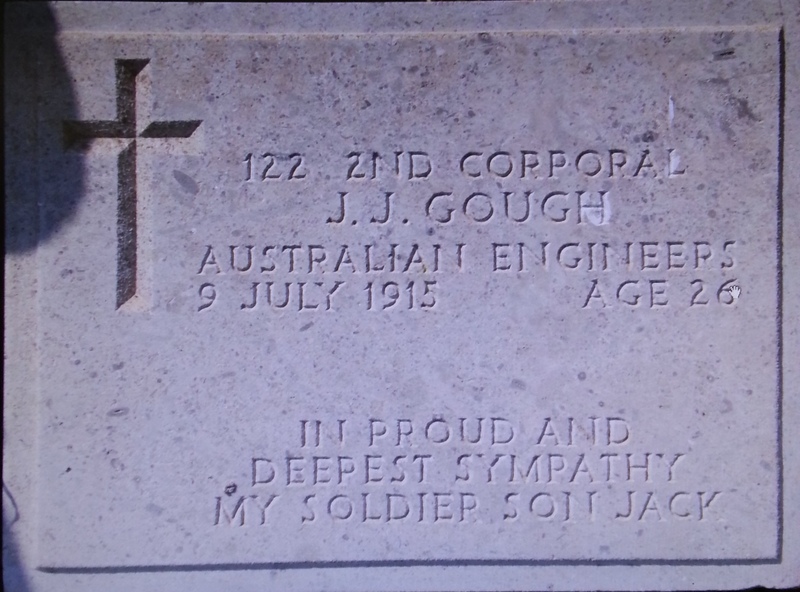 2nd Corp. 122 John (Jack) Joseph Gough or JJ, was born at No4 Bent st Paddington, Sydney. He was born in 1889 and attended Paddington public school. When he enlisted at 25 year of age. He was a steam engine driver and his skills and level of responsibility meant he was quickly promoted to lance corporal within a few weeks of enlisting and then later promoted to 2nd Corporal in January 1915. When JJ enlisted he stated he was living at Smiths Creek, Queensland and engaged in Mining work and his father John Gough was noted as his NOK, was also living at Smith’s Creek, Queensland. Elizabeth (Bessie) was not aware of her son’s death until the newspapers printed it in early August. 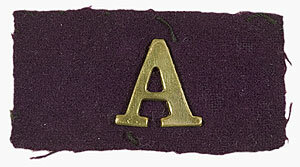 Her husband who was in fact the next of kin had separated from the family some 15 years earlier and she was unaware of his whereabouts until she received a letter from the Dunwich Asylum advising her of his sudden death a few months after her sons. 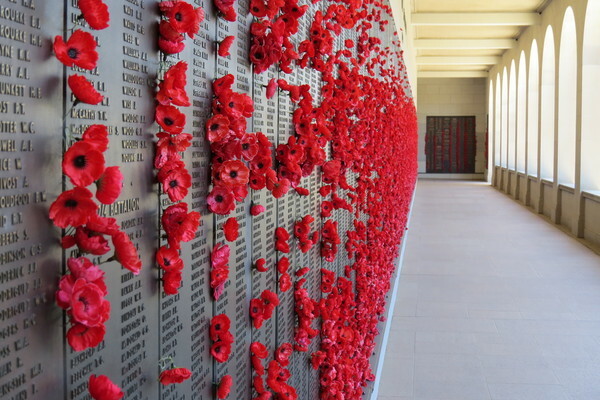 Bessie received a letter stating that her husband John had died on 24th September and he had been in the Benevolent Asylum in Dunwich , a state-run institution on North Stradbroke Island Queensland predominantly for the poor and destitute. Bessie was correct in Jacks father being absent for 15 years, but it appears she was not aware of his whereabouts or even her sons knowledge of his fathers circumstances. Perhaps JJ secretly knew of his father circumstances all along, as he placed his father as next of Kin and indicated on enlistment he was living at the same address as his father. Jack must have felt his father needed the money. These past few months must have been extremely difficult for JJ”s mother Bessie, and his brother George and sister Ida. Published –The Sydney Morning Herald NSW, Saturday 14 August 1915. This line is quoted from an article published in both the Sydney Morning Herald and Sydney Mail in August 1916 a year after JJ was killed. JJ was one of 29 soldiers who all came from Bent- street, a narrow thoroughfare in Paddington Sydney which consisted of only 30 houses . A year after JJ’ s death the press took advantage of this remarkable statistic and published a story with portraits, commenting on how Brent street and its men had become quite famous and had…..
“created widespread interest and the remark was commonly heard that Brent street had set an admirable example to the whole of the commonwealth”. 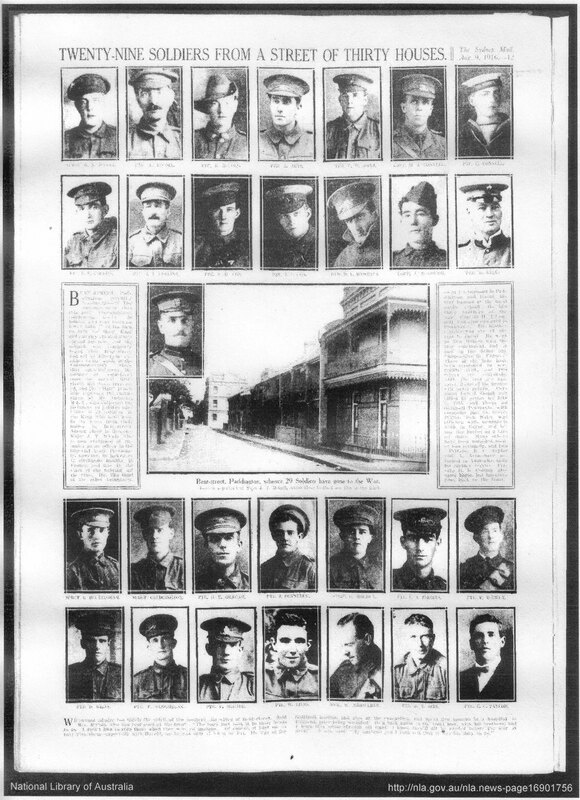 Source Sydney Mail Aug 9 , 1916. No 4 Bent street still stands today and after 100 years little change has changed to the small cottage or the street appearance where John Gough was born. Jack Gough was a well-loved man, the large number of insertions in the SMH on the honour roll from saddened friends and family was a testimony to his popularity back home. Inserted by his sorrowing relative P .A. Temple. His life for King and country What more ? Sadly missed by G. and G. McCabe. 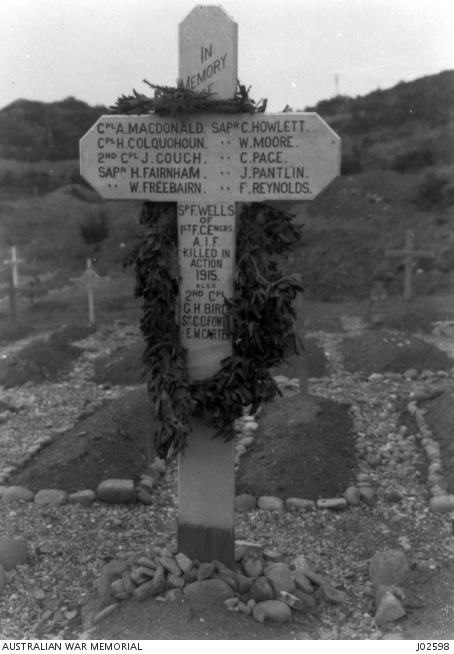 Engineers killed In action at the Dardanelles He knew no fear. Inserted by his late friends, Ellie and Ray. Mrs J. Rankin and Ellie. 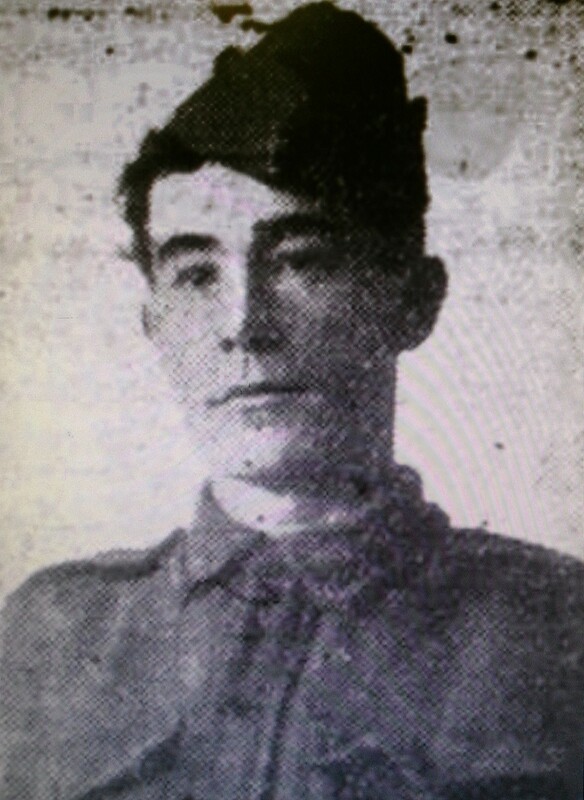 2nd Corporal John Joseph, 122, 1 Field Coy Engineers, AIF. Killed in action 9 July 1915, aged 26. Sister – Ida Mary – Born 1891, she married Percy F Flower in 1923. Paddington. In 1931 she is registered at the same address as her mother in 1917 “Kosciusko” 30 Rivers st Bellevue Hill and she was a music teacher. Her husband was not registered at the same address at this time. She remains at this address up to 1963 and is still a music teacher.